Prof. Anastas Todorov Ishirkov (1868-1937) was a Bulgarian scientist, geographer and ethnographer. He was founder of geographical science in Bulgaria. Member of BAS from 1904. Left a donation of 1 000 000 levas to various public and social institutions. Anastas Ishirkov was born on 5 April 1868 in Lovech. He remained an orphan in early childhood and was raised by his mother and grandmother. Graduated from Lovech Chitalishte and continued his education in Gabrovo's secondary class school. Because of participation in a student strike he moved in Veliko Tarnovo, where he completed secondary education (1888). Received a scholarship from the Ministry of Education and enroll to study history at Sofia University. Graduated and was appointed teacher in Varna Boys' School (1891). In 1892 Ishirkov was sent to specialization of Slavic philology in Leipzig, Germany, where he attended lectures in geography from professor Friedrich Ratzel. He also listened to courses of philosophy with Prof. Volkert, history with Prof. Lampreht, and slavistics with Prof. August Leskin. In August 1895 he defended a thesis entitled "Southern Bulgaria", with referee by Professor F. Ratzel. After his return to Bulgaria he was appointed teacher of geography at 1st Male High School in Sofia (1895) and the next year was sent by MNP at Berlin University, where he continued his specialization with famous geographer and explorer Ferdinand von Richthofen. On 1 February 1898, after a competition Anastas Ishirkov was appointed regular docent of geography and ethnography at Sofia University. Since 1903 he was extraordinary professor, and from 1909 professor in the Department of General and Cultural Political geography in the History and Philology Faculty. Prof. Ishirkov headed and co-created the Geographical Institute of the University (1898). Faculty's Dean from 1910-1911, 1918-1919, and 1920-1921. In 1915-1916 he was rector of Sofia University. From 1920 he was professor of geography at the Free University. Member of the Academic Council of Sofia University. Member of the Bulgarian Academy of Sciences in 1904. Member of scientific institutes in Germany, Poland, Hungary, the Bulgarian Agricultural Research Institute, and the Institute of Dobrudja and Pomoravia. Founder and chairman of the Bulgarian National Geographic Society (1918). Founding member of the Bulgarian Archaeological Institute (1920). Member of the editorial board of journals printed in Sofia, Leipzig, Vienna, and Lovech. 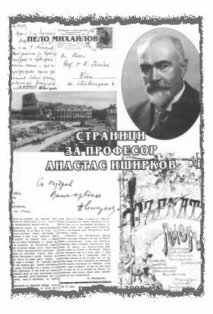 As a connoisseur on the Bulgarian national issue, Prof. Ishirkov performed political, cultural and scientific missions abroad. He was a member of the Bulgarian delegation for the signing of the peace agreement in Bucharest after the Balkan Wars (1913). He resided in Germany and Switzerland during the First World War. Wrote a memorandum to the Paris Peace Conference (1919). He was fluent in German, French, Russian and five other foreign languages. Prof. Ishirkov terminate his teaching job because of illness suffered in 1933. He bequeathed to the University of Sofia 900 000 levas. Anastas Ishirkov operated in all geographical areas of science, and later mainly in antropogeography and political geography. He paid particular attention to problems of population and settlements in Bulgaria. As the only professor of geography, he not only read courses in geomorphology, climatology, hydrology, antropogeography, political and historical geography, but set out the main tasks and directions of development of these sciences. Ishirkov laid the foundation of almost all disciplines and sector areas of geographical science in Bulgaria. Controversy he lead an indirect correspondence with famous Serbian geographer Jovan Cvijic as the latter challenges were trying to prove the population of greater Macedonia as an amorphous mass closer to the Serbs than to the Bulgarians. During the years 1917-1918 Prof. Ishirkov was a member of the Popular Pomoravia Educational Committee. Nowhere else in Europe are ethnic groups so intermixed as they are in Macedonia, especially southern Macedonia — states Cvijic. There is an existence of national and religious-national propaganda, and some of them for decades are forcing Macedonians, especially Macedonian Slavs, their own national identity, and with the same idea in mind are they also attempting to influence their language and theirs customs. Professor Jovan Cvijic (1865-1927) — Vienna doctor of geographic sciences, founder of Serbian geography and anthropic-geography, rector of Belgrade University, honorary doctor from Sorbonne and University in Prague and president of Serbian Academy of Sciences, one of the biggest names of Serbian science. As a scientist with international prestige, during a piece conference in Paris, after first world war, he was a president of territorial commission. Involving himself with Yugoslavian and Serbian questions, this scientist has walked throughout the Balkans, and was the one credited with the borders of Kingdom of Yugoslavia (land that was founded by king Alexander). 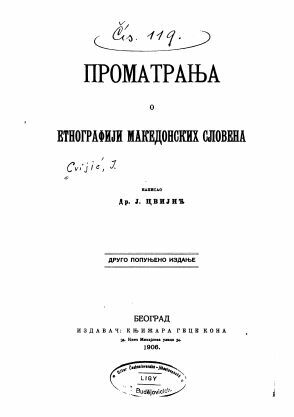 Responding to desires of numerous readers we are publishing sections of Cvijic's book "Observing the Ethnography of Macedonian Slavs", that was printed by the publishing house "Getse Kona", Belgrade, in year 1906. Nowhere else in Europe — states Cvijic — are ethnic groups so intermixed as they are in Macedonia, especially southern Macedonia. Further, there is examples of interchanging and assimilating from one ethnicity to another, especially Slavs into Greeks, Turks and Albanians, Tsintsars (Cincars) into Greeks and Slavs. — Somewhere it has just started, it shifts away somewhere, and somewhere it is almost complete. Finally, national mass of Macedonian 'Slovenes' (Slavs) has no specific national conscience, had no independent historical past, does not have its language. — There are three opinions on the colloquial language: close to Serbian, closer with Bulgarian and that it may be an independent south Slavic language. Therefore, there is no reliable ethnographic character, on the basis of which would the 'Slovenian' people become marked as Serb or Bulgarian. — Macedonian question remains further complicated with other influences. These are national and religious-national propaganda, and some of them for decades imposed Macedonia, the Macedonian Slavs in particular, to their national awareness and with regard covering language and customs values. — In the Balkan states that have right to Macedonia, the formation of intelligence has taken decades and around inaccurate performances of ethnic Macedonians. Each of the Balkan states applied all Macedonian Slavs to their nationalities, and it has created sorrow feelings in biggest segments of the intelligentsia. Because of this there is a public opinion, which it is mostly believed. — Foreign writers on the Macedonian Ethnographic question have made discussions on the basis of twofold information. Some of them are informed by the intelligence of a separate conclave of Balkan population and their supporters in Macedonia, and therefore represented inaccurate opinion. — Others, who have more independent work, knew almost nothing neither of Serbian nor of the Bulgarian language. They don't have the feeling that the people want to be reduced to Macedonian Slovenians, and ruled only by foreign characters, especially by name, marking them as Bulgarians. — In addition to this the concept of Macedonia in recent times has spread towards Skopje and Tetovo region, which were never considered being in reality part of Macedonia. 1. False geographical concept of borders of Macedonia. Skopje and Tetovo region belong to the old Serbia. 2. National mass of Macedonian Slavs has no specific national identification and national minds, neither Serb neither Bulgarian, although they are very related with the Serbs and Bulgarians. 3. Bulgarian names, which Macedonian Slavs as a rule consider their own, are not Ethnographic names and does not mean an ethnic Bulgarian. 4. Foreign German, French, English and other ethnographic maps of Macedonia are not ethnographic, but linguistic ones colored only on the basis of falsely understood Bulgarian names, with which Macedonian Slavs were often called. 5. Statistical tables are untrue or false. Picture 1: Sample illustration on the text above. (i). Commemorative photo of "Class-33"; the staff at Department of Geography (from left to right) — Ivan Batakliev, Yordan Kovachev, Prof. Anastas Ishirkov (center with white beard), Rafail Popov and Guncho Gunchev. Prof. Ishirkov died from cancer in 1937. Copyright © 2010 by the author.